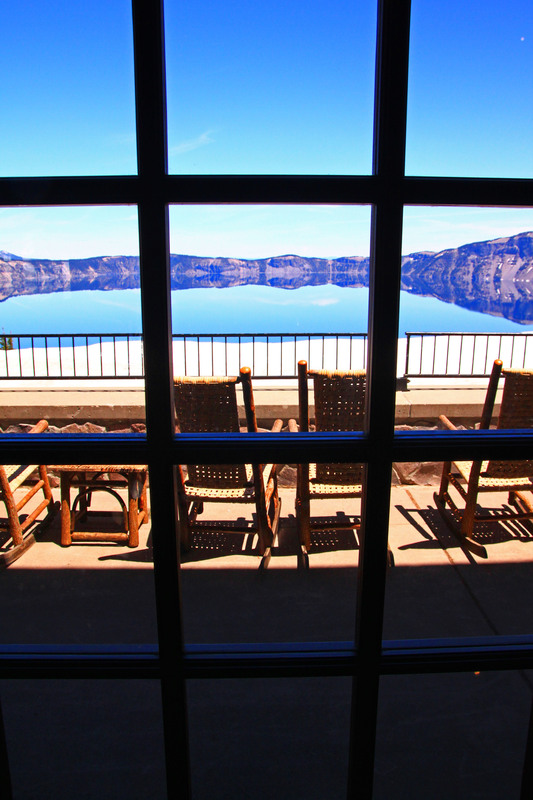 Crater Lake lodge is located at Crater Lake National Park and offers the best views of the lake. Not only is the lodge one of the most spectacular built lodges throughout the entire National Park system but it provides visitors the opportunity to view the entire lake. Most National Park lodges are tucked away and don’t really show the splendor and beauty of the park that made the lodges famous. However, Crater Lake lodge is perched on the best real estate surrounding the lake and is located in the best geographical location throughout the entire park system. There aren’t a lot of lodges that are built upon a caldera that erupted over 7,000 years ago and provide views of the nations deepest lake. The average snow fall at Crater Lake can exceed 533 inches, which made construction of the lodge very challenging. The lodge was constructed in 1915 and throughout the years, several additional building were built just below the lodge in order to provide additional amenities. This photo was taken from within the grand lodge and you can see that the views are spectacular from within the building. There are several rustic but comfortable chairs lining the very large deck that offers visitors the opportunity to lounge and take in the splendor of the views. Half of the rooms face towards the lake and you will be amazed of the views looking across the lake and into some of the mountains that sit just north and east of the park. The lodge is open year round but due to the snow pack, only the south entrance is open and plowed during the winter season. The north entrance normally doesn’t open until July and even parts of the rim road doesn’t open until July. I’ve visited the park during the first week of July and wasn’t able to drive via the north entrance near Diamond Lake. I ended up having to make that additional 50 mile drive but was able to avoid some of the traffic due to the fact that only the south entrance was open. I also brought my snow shoes and ended up being able to snow shoe through gobs of snow and even had the chance to trail blaze in areas that would normally be closed during peak summer. About 99% of the visitors only take the time to glance at the lake so you will have the opportunity to experience some great solitude as well as work on your tan since the sun in this part of the Southern Oregon Cascades is most epic. If you’re planning a visit to Oregon, Crater Lake National Park is a must. Crater Lake National Park, Oregon is a must stop for anyone traveling through the Southern Oregon Cascades. In fact, if you live in Oregon and you haven’t visited and explored the park, you are not even considered an outdoor person. It would be like living in Washington State and never visiting Mt. Rainier National Park. If you enjoy the outdoors and you haven’t visited Crater Lake then you might as well just tape yourself to your couch and call it a day. There are endless opportunities at the park. The Southern Oregon Cascades offer some of the most spectacular views in the entire lower 48 states. The hardest part is to agree on your favorite photo from the park. You will literally end up taking well over 1500 photos and then spend the next several days deciding on when to stop going through them. Historically, most visitors to the national parks only spend a few hours at the park and very rarely even venture 300 feet from their car. However, if you expect to really enjoy and have the opportunity to really take advantage of the splendor’s of the park, you will need to put on your hiking shoes or snow shoe gear and spend one or two days exploring the park. The snow can linger all year at the park and if you plan on visiting during the early parts of summer or late spring I would pack your snow shoes. This shot was taken on 5/30/12 and the snow was pretty deep. Usually the east part of the road stays closed until July and the snow drifts can linger well into July. I made sure to head out with my snow shoes since you couldn’t get close to the rim without trudging through several feet of soft snow. You can also amuse yourself by watching the fair weather visitors spend only about an hour at the park as well as doing nothing more than venture a few feet from the parking lot and only taking a few pictures. This is also a benefit to the nature lovers since you can almost feel completely alone in the park even though the main parking lot can be completely full. Late Spring and early Summer can be sun drenched and the glare from the snow and lake can cause a very intense sunburn so I would recommend bringing a lot of sun screen and applying it throughout the day since you will also be working up a good sweat. If you are wanting to venture near the rim, I would be very careful since some of the snow cornices can be very unstable due to the intense sun and warming temperatures. I rarely get too close but I have always been able to get some spectacular shots where ever I go. You literally can’t take a bad shot unless the sun is too intense or you are using the wrong settings on your camera. To get this shot I was using my Canon T1i and attached my Sigma 17-70mm lens and set the focal length at 28mm. Most of my shots are taken as a panoramic so I normally leave the rest of my lenses in the car. The aperture was at F-5.6 and I set the ISO at 100 due to the extreme glare. I also attached my CIR-PL and warming filter. Normally I would use my tripod but since the sun was out and the thought of lugging it around, I decided to leave it in the car. You will end up taking so many photos and covering so much ground, you will find that your tripod will spend most of its time in your backpack. You just want to be sure to keep a steady hand and try to ensure that it’s level. I always make sure to review every shot, by using the histogram, in order to ensure that it’s level. If not, I just delete and take another shot. [/caption] Crater Lake National Park offers some of the most amazing photography opportunities. This photo pretty much says it all! Mt. Thielsen is in the background, along with some amazing clouds hovering high above the park. The lake is where blue got its name and the rim on the other side stands out like a monolith like no other. There are hundreds of old trees like the one shown here that creates a fantastic scene, with the rocks in the foreground also creating an awesome personality. Because I was standing fairly close to the edge of the rim, I made sure to open the lens to 17mm in order to avoid any camera blur. I also attached my CIR-PL and warming filter in order to saturate the water. I wasn’t using a tripod so I made sure to set the camera lens at IS so I wouldn’t have too much camera shake or blur. This photo goes from 10 feet, in the foreground to over 3 miles in the distance. It’s pretty difficult to ensure that the entire scene won’t have any blur but the best way is to set the camera mode at Program and set the AF point to Automatic Selection. This will allow the camera to auto focus on each subject that you have included in the shot. You may have to move around the camera until the automatic selection captures everything but it’s well worth the effort. [/caption] This may look like an average rock standing in front of a blue sky but it’s actually Crater Lake behind this rock. That’s right! 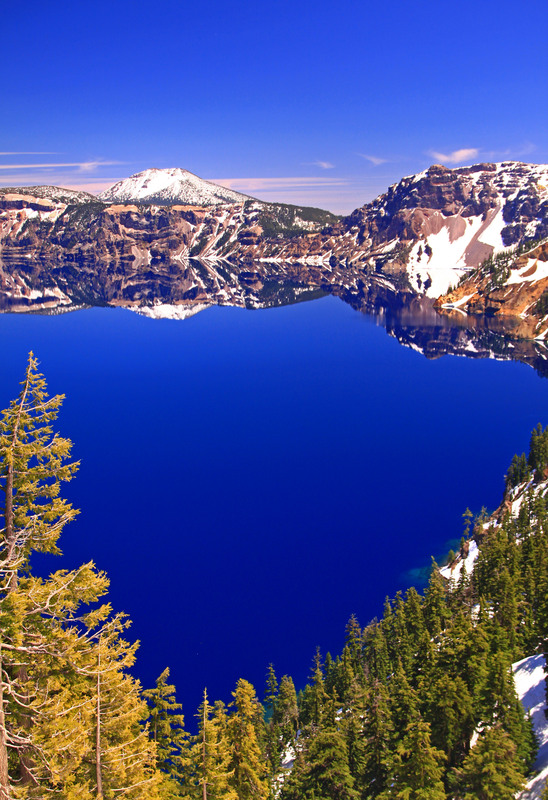 Crater Lake is so brilliantly blue, that it looks like a tropical blue sky. As you hike or scramble along the rocky rim of the Park, you have several opportunities to witness this type of phenomenon. The lake is so blue that it gives an impression of a blue sky and as you move across the rim you can see how the color of the lake will change colors, depending on the time of day or your location. To get the best opportunity, you do need to stand almost directly on the edge of the rim so you want to be careful since it’s pretty easy to lose your footing as you find yourself immersed in the out of body experience. To get this shot I climbed along the rocky rim and perched myself directly above the lake. I was able to get out of my snow shoes in order to climb on the rocks. I pointed my camera at about a 75 degree angle in order to get a good portion of the rock and as much of the lake without having any glare or reflection from the high clouds above. In fact, any clouds above will create a reflection in the lake so you need to look for a spot that’s perfect. I wasn’t using a tripod when I took this photo so I made sure to turn on my IS and keep a steady hand. I attached my CIR-PL and warming filter on my Sigma 17-70mm lens and set the focal length at 42mm. I was worried about camera shake or blur but I was still able to set the ISO at 100 and reduce the white balance at -1. Because I had the camera in normal/program mode the aperture was set at F-5.7 and the shutter speed at 1/128 second. Luckily, the sun was directly behind me and it was late in the morning so the overhead sky had the perfect amount of brightness. [/caption] The weather at Crater Lake National Park last week was absolutely epic and the snow pack was perfect for hiking and snow shoeing. There was just enough snow along the rim and higher elevations to create great photos but there was enough exposed rocks that you could climb along the edge of the rocky rim in order to get some even better shots. I took this photo while standing just above the Sinnott Memorial Overlook, which is near the Crater Lake lodge. The overlook wasn’t opened since the snow was too deep. I was looking almost directly north and the sun was pretty much directly behind me so I didn’t have to worry about any sun glare. However, you need to make sure to utilize your histogram when photographing Crater Lake since the lake itself can really alter the darkness of your shots due to the intense blueness of the lake and the glare from the snow along the rim. I always check the histogram after I take a photo and see if I need to make adjustments to the white balance. This limits the amount of photos that I will have to upload when I get home and reduces the amount of photos I end up deleting. Since I spent the entire day at the Park I ended up not using my tripod in order to cover as much ground as possible and taking as many photos that I could. I made sure to turn on my IS as well as taking advantage of the almost perfect lighting. I made sure to attach my CIR-PL and warming filter to my Sigma 17-70mm lens as well as set the ISO at 100. I also adjusted the white balance to -0.7 in order to get the perfect amount of brightness and limit the darkness. Since the camera was in normal/program mode, the aperture was automatically set at F-7 and the shutter speed was at 1/200 second. The fast shutter speed helped limit the need for a tripod and that was good since I wasn’t using it. [/caption] Mt. Thielsen with its incredible snow pack during late June in 2011. It’s hard to imagine that you can’t take more than 5 steps while hiking any of the Mt. Thielsen trails without running in to snow. You are well advised to bring your snow shoes if you plan on hiking near the higher elevations of the mountain. Most of the campsites within the Diamond Lake area are still closed due to the high snow pack and the north entrance to Crater Lake National Park isn’t scheduled to open until later this week. I took this photo near the snow park just south of Hwy 230 and about 1/2 mile south of Diamond Lake. I was using my Canon T1i along with my Sigma 17-70mm lens. It was about 8:35am and the sun was in the upper right hand of the photo which was creating a pretty intense glare unless you took cover in some shade. I made sure to attach my CIR-PL and warming filter in order to tone down the glare in the sky and warm the mountain as well as the forest in the foreground. I set the ISO to 100 and reduced the white balance to -1.3. I had the camera mode in Program/Normal mode so the aperture was automatically set at F-8 and the shutter speed at 1/320 second. I wanted to get as much of the mountain in the photo with the trees in the foreground so I set the focal length at 70mm. I was still able to have a really good depth of field since there were no distracting subjects too close to the main subject. [/caption] Visiting Crater Lake National Park during the early parts of summer offers some of the best weather and most exciting conditions available. This is especially true if the Park received a good amount of snow during the winter. This allows for the snow to hang around longer, which creates some spectacular photographic opportunities. However, you don’t want to wait too long since the park can get pretty crowded as the snow melts and the temperatures heat up. I was using my Canon T1i and my Tokina 12-24mm wild angle lens. I also attached my warming filter, UV filter and my CIR-PL. This photo was taken on June 30th and it was about 3:30pm so the sun was still pretty bright and the glare from the snow was created a strong hue. I was hiking along the south part of the rim so at least the sun was mostly behind me and wasn’t causing too much glare. I also made sure to stand in front of some large trees to block the sun even more. I made sure to use my tripod, bubble level and remote switch to ensure there was no blur. With all of the noise created when taking pictures at the Park it can be easy to confuse your lens and end up with some photos that are either out of focus or blurry. Since I do take mostly panoramic photos at least the field of view is fairly large. I had set the focal length at 14mm in order to get the most panoramic photo since I also wanted to include the sky above and the snow and trees along the bottom of the lake. This is very difficult considering the lake is enormous. Fortunately I didn’t need to dawn my snow-shoes even though the entire east part of the road was still closed due to 10 feet of snow blocking the road. However, I would recommend bringing some hiking poles, slip on cleats and maybe even some gaiters since you will find yourself hiking through snow until late July. [/caption] Last winter brought so much snow that the majority of Crater Lake was still covered in snow by mid June. Luckily, I brought my snow-shoes and had a great time shoeing around the south and west parts of the National Park. I entered through the south entrance and noticed that there was still 15 feet of snow on both sides of the road within the Park. I was stunned to see that most of the buildings were still almost completely buried in the snow. The heavy snow made my trip much slower than I had expected but the photo opportunities were epic. I took this photo from near the rim at Garfield Peak Trail. I decided to hike closer to the rim so I could get this particular shot with the pumice in the foreground and the trees below. Since I had my tripod with me it was more time consuming to get some of these types of shots since snow-shoeing so close to the edge of the rim was a little scary. However, it was well worth it since I got some pretty awesome shots and many of them would have turned out showing camera shake since the saturation was so intense. I took this shot with my Sigma 17-70mm lens with the focal length at 21mm and attached my CIR-PL and warming filter. Because I had the camera in Normal/Program mode the aperture was at F-7.1 and the shutter speed at 1/166 second. I had the ISO at 100 and the white balance at -0.7 due to the brightness from the glare of the snow and the sky. I also took this shot at 12:15pm so the sun was very high in the sky which created a lot of challenges since I was constantly looking for shade to block the sun. I was using my tripod, bubble level and remote switch to ensure there wouldn’t be any camera shake or blur. [/caption] Mt. Thielsen with its incredible snow pack during late June. It’s hard to imagine that you can’t take more than 5 steps while hiking any of the Mt. Thielsen trails without running in to snow. You are well advised to bring your snow shoes if you plan on hiking near the higher elevations of the mountain. Most of the campsites within the Diamond Lake area are still closed due to the high snow pack and the north entrance to Crater Lake National Park isn’t scheduled to open until later this week. I took this photo near the snow park just south of Hwy 230 and about 1/2 mile south of Diamond Lake. I was using my Canon T1i along with my Sigma 17-70mm lens. It was about 8:35am and the sun was in the upper right hand of the photo which was creating a pretty intense glare unless you took cover in some shade. I made sure to attach my CIR-PL and warming filter in order to tone down the glare in the sky and warm the mountain as well as the forest in the foreground. I set the ISO to 100 and reduced the white balance to -1.3. I had the camera mode in Program/Normal mode so the aperture was automatically set at F-8 and the shutter speed at 1/320 second. I wanted to get as much of the mountain in the photo with the trees in the foreground so I set the focal length at 70mm. I was still able to have a really good depth of field since there were no distracting subjects too close to the main subject. [/caption] Crater lake offers so many different shades of blue that you can almost see the color of the lake turn to different shades of blue as you hike along the rim. The time of day, season and direction that you are facing is the major factor in the changing of the blueness of the lake. I took this shot back on 6/30/10 and the time of day was 4:00pm. I was facing towards the west so the sun was at about a 90 degree angle on my left. My position helped bring out the amazing blue color of the lake. I made sure to include some of the snow in the foreground in order to highlight the trees. I was using my Canon T1i along with my Tokina 12-24mm wide angle lens. I had the focal length at 13mm in order to get the most panoramic photo that I could. The camera mode was in Program/Normal so the aperture was at F-5.6 and the shutter as 1/60 second. I set the ISO to 100 in order to ensure that the sensor captured the best light and set the white balance to -0.3 due to the intense glare from the lake, sky and snow. I made sure to attach my CIR-PL and my warming filter.